Japan’s Prime Minister Shinzo Abe has achieved success in Washington. He will not be called “cold pizza”, as was one of his predecessors. And he is making Washington issue a warning to China. He has managed it not by preaching democratic values, although he does talk about shared ideals. Instead, he has made his point by paying a visit to the controversial Yasukuni Shrine, where Japan’s war dead (including Class A war criminals) are honoured. And his comparison between East Asia and Europe in 1914 carries with it an implicit warning that the United States could be drawn into a major conflict. This is a lesson in modern communication. Washington now not only has to worry about Chinese unpredictability, but also about Japanese audacity. Abe’s shrewd moves are rooted in early twentieth-century Japanese history. For decades, Japan has been the most self-effacing G8 country. But as Beijing abandons its “low profile” in favour of a more assertive strategy, Tokyo must wonder what it is getting in exchange for being the most polite member of the international community. This is an old dilemma. After the League of Nations condemned Japan’s annexation of Manchuria in 1933, a Japanese diplomat famously quipped: “the Western powers taught us to play poker, but after they had acquired most of the chips they pronounced the game immoral and took up contract bridge.” Today, China has initiated a poker game throughout the East and South China Seas. Can Japan go on playing contract bridge? The fact of Abe’s visit to Yasukuni overshadowed the speech he delivered there, along with his pledge that “Japan would never wage a war again”. 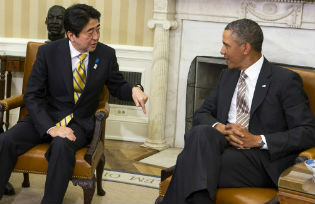 Abe’s gesture was met with a rare condemnation from Washington. Even so, it had delivered a warning: Japan will not go the way of Taiwan, which is in the process of Finlandisation. Abe likened China’s present-day relations with Japan to the tense relations between Germany and Britain in 1914. But the comparison does not hold. Nations today are much more interdependent than they were in 1914. A more apt comparison would be to the Japan of the 1920s and to Western behaviour towards the rising power at that time. As China is now, Japan was torn between adopting international law and subscribing to the idea of the rule of the strongest in order to build up its own regional empire west of Hawaii. In response, the Anglo-American alliance in the Far East alternated between appeasement and containment. Each step back by Washington and London convinced Japan’s hawks that they could move two steps further forward. At the time, Japan was still a parliamentary monarchy, one that had embarked on colonisation but had not engaged in outright invasion. History could have gone very differently. That situation is echoed today. China’s President Xi Jinping told US President Barack Obama that “the Pacific Ocean has enough space for two large countries like the United States and China”, excluding all the other countries in the region. East Asia is in a bind. The US ambiguous stance on territorial disputes has served a useful purpose: to enable the US to avoid a confrontation with China that would not be on its own terms, and to play for time in the hope that change will turn out for the best. But ambiguity comes with a price. China is testing the regional order, and US allies in the region have begun to fret about the solidity of US security guarantees. Abe’s soundbites, therefore, have served as a more influential warning to Washington than a flotilla of Chinese boats could have. Washington’s inaction increases the possibility that one or several parties could make a wrong move. It could be China, betting that other Asian states will remain in check. Equally, it could be one of the US’s treaty allies, taking national security into its own hands. In fact, the most likely trigger for armed conflict would be a counter move by Japan against China’s continuous incursions. Pinning down Washington is no small feat for Japan, always the junior member of the Security Treaty with the US. The realist view of alliances says that the weaker partner can only cause the stronger to commit by putting itself completely on the line. Successive Japanese prime ministers, mired in their own moderation, had been taken for granted by Washington. Abe’s use of history may be offensive, but the noise level has caused the message to get through. In politics, that is all that counts. To forestall a flare-up, Washington has to provide its allies with some reassurance. Washington hopes that a mixed response will be enough. At the operational level, several key US officials have recently set down markers for China’s behaviour. China must state clearly the legal basis for its territorial claims. It should cease barring access to contested rocks. And if China continues to assert its air defence zones, the US will change its military posture, to satisfy Japan as its most important ally. At a higher political level, US Secretary of State John Kerry also delivered a careful public warning in Beijing, focusing on rules of the road for the South and East China Seas. The Obama administration is firming up its support for its Asian allies, while clearly hoping that the cheque will never be cashed. East Asia has lived through a long peace. This peace was predicated on the involvement of the US, not on any power balance or genuine resolution of disputes. But with China on the rise, immobility is no longer a viable option. Sooner or later, settlements must be found, or territorial disputes will turn into open conflict. Abe’s wake-up call does not force the US to choose conflict or resolution, but it makes a compelling case to take both options to China.